Made it! 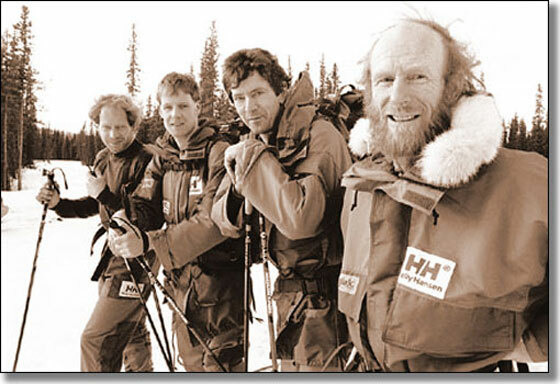 Yukoner Martyn Williams, right, completed the international North Pole Expedition is six weeks along with Mike McDowell and brothers Sju and Simen Modre, at left. Whitehorse resident Martyn Williams has become the first Canadian to reach both poles of the earth using only skies and a small dog team. Williams, 44 and his three companions on the International north Pole Expedition were picked up Saturday after six grueling weeks of fighting severe temperatures, driving winds, and tough, unpredictable sea ice. All four members of the group are South Pole veterans. Australian Mike McDowell 44, accompanied Williams to the South Pole in 1990. Norwegian brothers Sjur, 27, and Simen Modre, 29, traveled to the South Pole in 1991. Many people have reached both poles without mechanized assistance. Until now, only Briton Robert Swan traveled from South to North. The group is now resting at the advance base on Ellesmere Island before they return tonight to Resolute Bay, N.W.T. Tough terrain slowed progress for the first few weeks. However, the expedition traveled more than 25 kilometers a day in the last couple of weeks to make up for last time. They had to reach the pole by May 12. After that date, warming temperatures cause fog and broken ice, which makes air pick-up impossible. "But part of it was because they just really wanted to get out of there,” Jill Pangman, a friend of Williams', said in an interview today. She has been receiving notes from Williams sent via resupply flights. The trip has been much tougher than expected, Pangman said. Temperatures have averaged about -35º and driving winds have caused frostbite. A team of eight dogs has been more of a hindrance than a help. Pangman said. "It's really hard to write. Fingers would freeze up after every sentence."